For anyone in need of assistance getting around, a ramp designed for easy entering and exiting of the home can make all the difference. 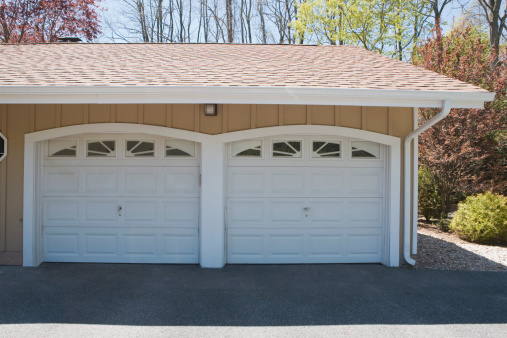 Rather than add on to the outside of the home, you can construct a small but supportive ramp in the confines of your covered garage, safe from the elements and for a fraction of the price. Perhaps the most important thing to keep in mind when constructing a ramp is your slope, rise and run calculations. When drawn out, this will look like some variation of a right triangle. The rise of a ramp is the height, which is measured in inches from the foot of the door to the ground. The slope represents how steep your ramp will be. This is always determined by the rise, but will ultimately depend on who's using the ramp and what they'll need it for (for example, a wheelchair user may need a less steep incline than someone who relies on a walker or crutches). Most slopes measure 1:12, meaning for every inch of your rise you'll have 12 inches on your run. A door 12 inches off the ground, for example, will result in a 12-foot ramp by these calculations. Of course, a gentle slope of 1:20 or similar will make for a smoother trip up and down, so if you have space, use it. Finally, the width of your ramp should measure at least two inches more than that of the door the ramp is attached to, although extra room for anyone assisting with a wheelchair is always preferable. Thirty-six inches is compliant with Americans with Disabilities Act standards, but 48 inches will allow for a safe turnaround for anyone involved. A platform typically measuring 5 feet by 5 feet (check for guidelines in your area to be certain) should be affixed to the top of the ramp as well, and when measuring, always account for doors if they open out toward the ramp. As always, before constructing anything, be sure to check with building codes in your area before you start assembling your ramp to ensure that your structure is safe and that you won't run into any problems down the road. While there are a lot of materials to choose from, wood is typically easy for even the most amateur carpenter to work with, so start by purchasing pressure-treated and sealed lumber cut to the sizes you need. Cut 2x4 pieces of wood to serve as a supportive handrail and studs for your structure, and use wood screws and a drill to fashion everything together. ADA-compliant rails should be no shorter than 34 inches, though you may need to cut your 2x4 studs down depending on how high you ramp will sit. For extra safety, affixing an anti-slip tape or indoor/outdoor carpet to the surface of the ramp will help prevent any injuries. Because this ramp is meant to fit inside the limited confines of a garage, the best way to make the most of your space is to run the ramp along the edge of the wall, rather than having it face out into the middle of the garage. The best design for a DIY project in the garage is to create a wedge using the measurements for your rise, slope and run. It's best to build your ramp in small sections and fit them together rather than build straight from the door, as any mistakes will be harder to fix that way. Start by constructing your landing to size. Affix 2x4 studs vertically along the sides and corner, and assemble so the foot of the door and the surface of the landing is on the same level (do your best to avoid any gaps or bumps to allow for a seamless ride.) Next, affix the 2x4 studs to either side of your ramp, spacing them equally to create a sturdy handrail and additional support for your structure. Drill the two finished components together using wood screws and place nonslip protection on the surface of your ramp. If the end of your ramp doesn't rest flush on the floor, create a second landing at the bottom to allow for a smooth transition.